Connect with your customers on mobile devices. The online landscape has shifted dramatically towards mobile devices. Over 80% of adults online have a smartphone. Mobile marketing strategies can reach prospective customers with interactive communication tuned to buyer behavior when they are most likely to purchase. For many companies, a responsive website and creative marketing designed for multiple mobile devices is a good place to start. One of our clients was surprised to learn that over 50% of their traffic was coming from mobile devices. Defining goals and how to measure those goals is a key first step. We’ll help you develop key questions and conduct interviews that build a framework for a solid mobile strategy. Deciding on what kind of mobile environment works for your goals is that next step. Do you need a mobile site, or a mobile application? Both are desirable, but represent different purposes. 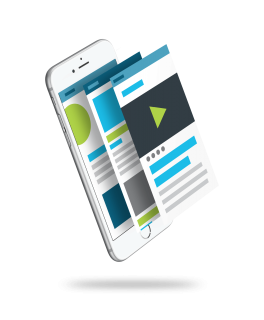 Mobile sites provide the foundation for the same information found on your website. And, it is particularly suited to simplified shopping experiences, on-the-go services and access to instant information. For deeper engagement, mobile apps are for customer loyalists that need to interact with your brand, when and where they want. A mobile marketing plan can deliver relevant content to different audience segments to increase ROI. According to KISSMetrics, “over 40% of smartphone users watch TV while browsing a smartphone”. Other research shows that the more devices we have, the more time we spend online. That means designing campaigns for different devices, based on location and time-of-day. What Does Your Business Need for a Mobile Strategy?